Below are pictures and instructions for oblique sit ups and links to pages on Crunches and Stomach Exercises. This exercise is similar to the regular situp, but it emphasizes the internal obliques and external obliques a little more. 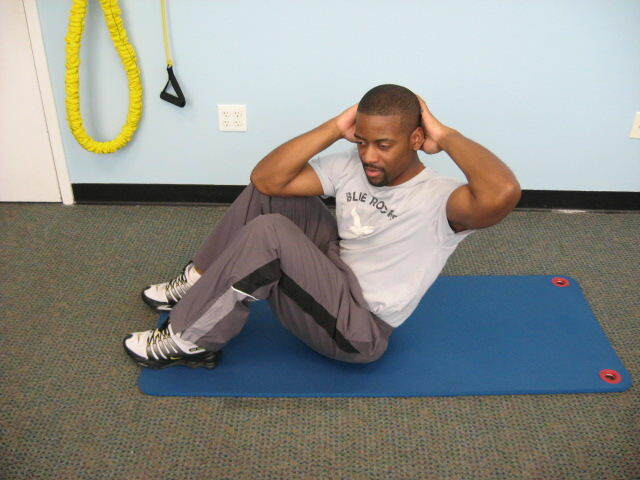 Any time you add rotation to an ab exercise you increase the activation in the obliques. Here's the form for the exercise. Starting Position: Begin by lying on your back with your knees bent and your hands behind your head. Form: Exhale and curl your body up towards your knees. As you approach the top of the movement, twist your upper body to one side. Then slowly untwist and lower to the starting position. Personal Training Tips: If you have lower back pain during the exercise, discontinue it and consult with a health professional. You can perform this exercise in two ways. You can do 8-20 repetitions on one side, rest, and then perform 8-20 repetitions on the other side. Or you can alternate sides for 8-20 repetitions. As you strength improves, you may perform more than 20 repetitions per set. This exercise not for everyone-- they are definitely harder on the lower back than crunches. If you are an avid athlete in a competitive sport that involves running, sprinting, jumping, or throwing this exercise could aid your speed and performance. However, if you have poor flexibility, weak lower back muscles, or a previous lower back injury, I recommend trying some easier exerises. You can visit the Directory of Abdominal Exercises to view all the ab exercises on this site. Read my page on Finding the Best Abdominal Exercise for your ab workouts or click on the links below to learn more about each topic.